The DCSD East Junior All-Stars struck for nine runs over two innings to pull away from the West for a 12-4 win to pull within one win of tying the series with the West. The West had won the past two matchups 4-3 (2015) and 13-6 (2016) to take a 3-1 lead in the series which started in 2013 heading into Thursday’s matchup. Leading 3-1 heading into the bottom of the fourth, the East would strike for four runs behind a bases-loaded triple down deep into the right field corner by Tucker’s Trevon Flowers. Flowers moved on home on the play as a throwing error allowed him to go the final 90 feet for a 7-1 lead heading into the fifth inning. The West got a runner to second in the top of the fifth, but failed to score to bring the East back in to bat in the bottom of the inning. Miller Grove’s Zandon Finch loaded the bases with a one-out single to set the table for Arabia Mountain’s Silas Butler. Butler, who had led off the game with a solo homer in the first inning, lined a double into right-center field to score Southwest DeKalb’s Jeremy Hatchett and Arabia teammate Jalyn Hawkins for a 9-1 lead. A couple of wild pitches moved Finch and Butler across the plate and Redan’s Kelvin Smith would walk, steal second and score on another wild pitch to make it a 12-1 advantage heading into the sixth inning. The West put a pair of runs on the board in the top of the sixth on a deep shot over the center field fence by Cedar Grove’s Rashad Preston that scored Druid Hills’ Joseph Hiley, who had walked to start the inning, to make it a 12-3 game. Jack Hardin’s sacrifice fly in the seventh to score Decatur’s Jarrett Ford made the final of 12-4. The East had started the game with Butler’s solo homer and Redan’s Orlando Adams doubled to score Flowers for the early 2-0 lead. Kelvin Smith’s sacrifice fly to score Hawkins made it 3-0 in the second inning. Columbia’s Elijah Hammonds doubled and score on an error to put the West on the scoreboard in the third inning. 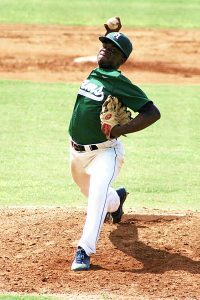 Butler became the second Arabia Mountain Ram named Junior MVP joining Jordan Mitchell (2011). Butler finished the day with a 3-3 performance at the plate, a walk, a double, a homerun and three RBIs. His 3-3 day at the plate tied the Junior record set by Redan’s DeAnthony Baker in 2014 and tied by McNair’s Shaquille Hickson in 2015. Cedar Grove’s Rashad Preston became the first Cedar Grove Saint to earn Junior All-Star MVP honors. Preston was 1-3 on the day with a two-run homer and a stolen base. 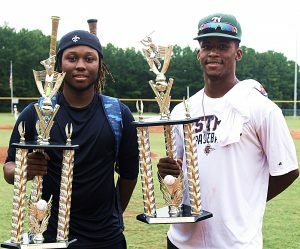 Butler and Preston became just the third and fourth Junior All-Stars to hit homeruns in the nine-year history of the All-Star Classic. The joined Deion Sellers of Cedar Grove (2013) and Drew Hinton of Lakeside (2015).